The nine transnational activists are hoping for a humanitarian return to the United States and are now organizing detainees to halt deportations. This post originally appeared at Colorlines. 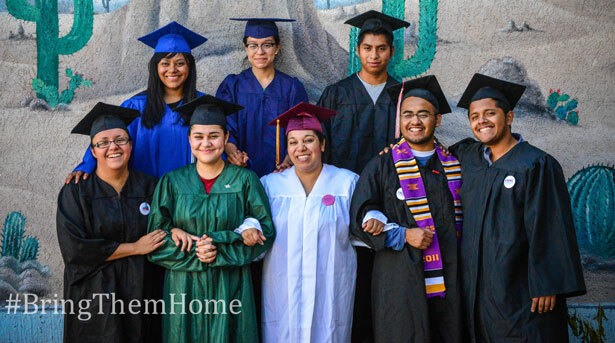 Nine people, all transnational activists working with the National Immigrant Youth Alliance (NIYA), are now being held at the Florence Detention Center in Arizona after petitioning to enter the United States on humanitarian grounds. This is the first time a group of longtime US residents who are technically Mexican nationals have attempted to return to the states by petitioning for humanitarian parole. Monday’s action attracted more than 10,000 viewers from around the world who tuned into a Ustream live feed to see what would become of the so-called Dream 9. At around 1:30 pm EDT, the nine crossers gathered for a final press opportunity in Nogales, Mexico, before taking a short walk to the dividing line between the United States and Mexico. Eight people had originally planned to participate but Rosie Rojas, who said she traveled for three days to meet them, joined the action at the last minute. Among the nine activists was 22-year-old Adriana Diaz, who was brought to Phoenix, Arizona, from Mexico when she was just four months old. Diaz graduated high school with honors in 2010 but decided to go to Mexico last year because of the fear she felt living under Sheriff Joe Arpaio. She attempted to attend college there but the country doesn’t recognize her US diploma. Had she waited just three months, she could have been eligible to stay in the United States under President Obama’s Deferred Action for Childhood Arrivals program. Diaz was one of six members of the Dream 9 who were either deported or left the United States on their own accord. The other three seeking humanitarian parole landed in Mexico in the last two weeks. Humanitarian parole would mean that the nine would be released on grounds that they don’t pose a threat to society. But authorities have apparently denied their petitions, so the activists are now seeking asylum. While the Dream 9 crossers are now facing the perils of detention, the uncertainty was perhaps more elevated for the three activists who went to Mexico more recently to take part in the action. Although undocumented people in the United States live under the constant threat of detention and deportation, there is a relative safety in staying here. Those three who willingly crossed into Mexico are facing the new uncertainty of not being able to return to their respective homes, after having just left them. The Dream 9 are not alone in their action. The NIYA is now maintaining a waiting list of people who want to use the strategy; they’re drawn to the idea that there is a humanitarian option. Just hours after the Dream 9 crossed, a group of thirty people who had already been deported to Mexico attempted to cross as well. It’s unclear what became of their effort. Pima County public defender Margo Cowan, who is providing legal services for the Dream 9, said she will support the effort of the thirty additional crossers, should they need it. As the Dream 9 approached the border, supporters on the US side—including citizens, green card holders and undocumented activists—could be heard screaming, “Bring them home!” The NIYA informed supporters that the border patrol had sent an e-mail threatening immediate arrest and deportation as soon as the Dream 9 crossed into the United States. Those moments of uncertainty are traces, in some ways, of the anxiety that some family members feel, the loved ones of those more than 1.5 million people who have been detained and deported by the Obama administration. Yet the nine were not deported immediately, and are now in detention hoping to attain some form of relief in order to return home. That desire relies heavily on lawmakers whose influence on Capitol Hill could sway the outcome. Representative Luis Gutierrez (D-IL) took to social media to say that he hopes “the Obama administration will do the right thing.” But for many, that’s not nearly enough. Immigration officials would not comment on the crossing or subsequent detention citing privacy concerns. In order to attain asylum, the Dream 9 will have to convince authorities that they will face certain persecution in Mexico. But Obama and other lawmakers can take swift action to otherwise secure their release. To that end, the NIYA is asking supporters to sign a petition and call lawmakers to keep the pressure on as the Dream 9 are kept at the Florence Detention Center—a facility that is privately owned and operated by the Corrections Corporation of America. Before the initial eight crossers took their action at the border, they spent several days mapping out how to organize other detainees once they were taken into custody. Their goal now is to not only demonstrate that a humanitarian return home is possible but also to halt deportations from detention. What was the role of white supremacy in the acquittal of George Zimmerman?